Learning the bass is both hard and exciting. When compared to electric guitar, bass seems to be a completely different instrument. And to be honest, it is. The bass player’s job is to connect the drums and the rest of the bend and keep everything in sync. Therefore, bass guitar operates in quite a different environment. Be that as it may, the bass guitar is a quite fun and exciting instrument to play. However, most of the beginners face one main issue when they are starting their bass journey. The issue is the selection of the bass guitar to start with. This is why we made this buying guide. We want to make it easier for you to choose the best bass guitar to start to play with. Here are our top picks. In most cases, your choice of the first bass guitar is going to depend on two factors. The first factor is your budget, and the second factor is related to how comfortable you feel while playing certain bass guitar. Both of these factors are very important in your choice of a perfect bass guitar to start your journey. When it comes to the budget, there is really no limit. Bass guitars can cost from around $150 to several thousand. However, what you need to figure out is the minimal amount of money you want to spend. If you want to buy a new bass guitar, we highly recommend that you stay away from basses under $150. Somewhere around $200 is a recommendable price to go for when it comes to beginner’s bass guitars. Furthermore, we wouldn’t recommend that you buy a bass guitar that costs over $500 until you build up some experience and skill. Learning to play the bass is going to be a bit uncomfortable in the beginning. Be sure that it will be way more uncomfortable than learning to play the guitar. It has a larger scale and you need to stretch your fingers much further. Some of the bass players never get comfortable with playing standard scale bass so they use a short scale bass guitars. The body shape also matters. Some of the bass guitars are larger than others and the balance can be a problem sometimes. So, finding the bass that feels comfortable can take some time, but it’s worth doing it. After all, you are going to spend a lot of time holding it so it better be comfortable enough. Most of the bass guitars have four strings. However, there are also some models with 5, 6, or even 7 strings. We highly recommend that you start with a standard 4-string bass guitar. This is more than enough for the start; it’s already complicated enough without additional strings. When you build up some skill you can switch to a 5-string or a 6-string bass if you wish. However, you can be sure that the 4-string bass won’t limit you in any way no matter what music genre you play. One of the greatest bass players of all times, Jaco Pastorius, once said: “You don’t need more strings, you need more practice.” However, that’s just a matter of personal preference. There are two types of electronics in bass guitars, same as in electric guitars. There are active and passive models. Both of these have their own benefits and flaws. Passive electronic models are usually cheaper and they don’t require any external power source in order to work and they are usually more expressive. When it comes to active electronic models, these are much hotter, meaning that they have a better output. When it comes to beginner’s basses, you really don’t have to worry too much about this. Passive electronics are just fine. When you develop a proper taste for the tone you can switch to active setup if the passive one is not working for you. Affordable beginner basses can come with a few different pickup layouts. We have precision, jazz, PJ, and standard double pickup layout. The most common type is the precision layout. This type of layout features a split coil pickup at the neck position. It has a fatter tone, it’s very reliable, and it costs less. Jazz layout features two single coil pickups (neck and bridge position). This layout is much clearer than precision layout but it lacks some girth. PJ is a hybrid layout. These basses have one split coil pickup at the neck position and one single coil pickup at the bridge position. This type of layout combines the benefits of both jazz and precision layout and it makes a decent middle. Standard double pickup model includes two single coil or two humbucker pickups. Each of these two options is great and it’s just a matter of personal preference which option will you choose. The best advice we can give you is to buy the best bass guitar you can with your money. For some of you, that means the good entry lever bass, for some that may be higher on the ladder. However, it’s important that you make your decision if you are serious about playing the bass. If you see yourself playing the bass for a long time, the more expensive bass guitar is a good choice. However, if you are not completely sure, then you might want to consider something cheaper. Also, it’s recommendable that you have a bit more experienced bass player by your side so he can give you some advice before you make your final choice. Squier basses are made by Fender, a standout amongst the most well-known guitar companies on the planet. The Fender Jazz Bass has been a most loved by performers in a wide range of classes for a considerable length of time, from jazz to blues to country and even heavy metal. Be that as it may, with a price of over $1,000, it’s not precisely the sort of instrument a beginner would play! However, this is the place the Squier line comes in. Through Squier Fender can offer low-price instruments in view of their great designs, and begin another age of bassists off on the correct foot. The Affinity is an exceptionally decent bass at the cost, yet I don’t put it at the highest priority on the rundown unless an amateur is searching particularly for a Jazz Bass. For quite a long time the Fender Jazz Bass sound has touched types as different as a rock, country, metal and, obviously, jazz. This is a great outline by Fender, in light of one of their most amazing instruments. For beginners searching for their first guitar, it is difficult to beat the Squier Affinity variant. Squier bass guitars are reasonable instruments made for amateurs, however, recall that they all must meet Fender’s exclusive requirements. This is yet another great beginner’s instrument based on a great Fender. So what are the contrasts between the Precision and the Jazz? The Precision Bass has a somewhat bigger body and, all the more essential for amateurs, a marginally thicker neck. The conventional P-Bass has a solitary pickup, contrasted with the double pickup Jazz Bass. This implies the Jazz is equipped for a more extensive cluster of tones. The sound of the Precision has a tendency to be punchier, and more material to rock music, however, P-basses have unquestionably been utilized adequately in jazz, funk, and pretty much every other style of music. Notwithstanding, on account of the PJ, we see the expansion of a jazz-style pickup at the bridge position. That implies a more extensive range of tones for amateurs to investigate. The Precision Bass is incredible for artists who need a forceful tone. With regards to budget Squiers, I have dependably believed that the Precision sounds more like a Precision Bass should, than the Jazz sounds like a Jazz Bass should. The Fender Precision Bass sound is profound, punchy and forceful, and it has surely made a home in heavier types of music. In any case, one pickup runs far with this bass, and the P-Bass is as proficient in rock and jazz as it is in heavy metal. This Squier Affinity variant gives amateurs a chance to begin their music professions off with a genuine Fender exemplary. ESP LTD guitars are for the most part designed more for the hard rock and the metal players, yet the B-10 looks like it would fit pretty much any class. Like a Precision Bass, it’s a solitary pickup instrument, so you’ll get that punchy tone. Contrasted with a Squier Precision Bass, the neck is quicker and somewhat more slender. It offers less tonal assortment than the Ibanez or Yamaha yet has a comparative feel and an awesome sound. 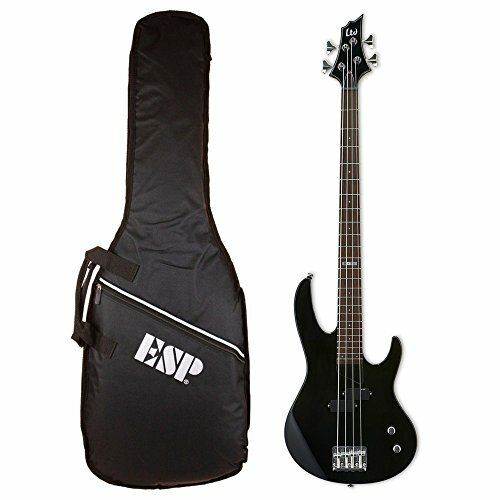 ESP is outright known for quality, and that continues to their LTD line. This quality, alongside its neck and construct, put it straight up there with the Ibanez. It’s a Precision Bass with a metal state of mind. The LTD B-10 is a straightforward bass for apprentices who are into heavier music. Notwithstanding, similar to a P-Bass, you can dial it back and analyze in jazz and lighter genres on the off chance that you wish to. ESP LTD is known for building incredible intermediate and novice level guitars and the LTD B-10 comes through. Yamaha is another great bass producer that gives the novice an extraordinary value for their money. The TRBX174 is a straightforward, quality bass with an extraordinary style, and like the Ibanez, it’s anything but difficult to play. Yamaha is best known in the class of jazz and rock; however, this starter bass can push it between any classifications. The TRBX174 additionally arrives in an EW model, including more outlandish finishes and woods. This won’t be a worry for more beginner bassists, but for a cost knock of just a couple of dollars, it’s a decent alternative. Yamaha basses sound astounding, and even the lower-end models are known for incredible tone. I feel the Ibanez is an indent above, however, I’d put this Yamaha appropriate in there with the Squiers. The Yamaha TRBX174 is an adaptable bass that joins P and J style pickups. This bass is an awesome decision for beginners who are into a wide range of types of music. Ibanez is an organization known for making incredible heavy metal guitars, however, numerous rock and jazz performer have discovered awesome incentive in Ibanez basses too. Like their guitars, Ibanez basses are known for having slim, quick necks. Their Soundgear line, specifically, is appropriate to new players, or the individuals who simply need the speediest necks they can discover. Soundgear basses likewise have marginally smaller string dividing when contrasted with the Squiers above. This implies they’re somewhat more qualified for playing with a pick. The Ibanez’s higher-end models are astonishing instruments, and the kid GSR is an extraordinary starter bass for anybody hoping to walk that metal way. I put this bass high up on the rundown of best decisions for beginners. Ibanez Soundgear basses are flexible, and as a result of their thin necks, they are somewhat less demanding for fledglings to play. Buying the first instrument is always hard. This is because you still don’t know what exactly you want. However, with all the information we provided, the choice shouldn’t be too hard. In our opinion, the best bass for the beginners is the Yamaha TRBX174 RM. However, the Squiers are also very highly rated. The Yamaha is a very versatile bass guitar and that’s why we choose it as a winner. You can play many different genres with this bass and it feels very comfortable and it’s easy to play, which makes it an excellent bass for the beginners.